The 1998 Atlanta Braves season marked the franchise's 33rd season in Atlanta and 128th overall. They went on to win their seventh consecutive division title, taking the National League East title by 18 games over the second place New York Mets. The team featured six all stars: shortstop Walt Weiss and third baseman Chipper Jones were voted as starters, while first baseman Andrés Galarraga, catcher Javy López, and pitchers Tom Glavine and Greg Maddux were selected as reserves. Jones and Lopez each hit over 30 home runs as Galaragga (acquired from Colorado) led the club in home runs and RBI. Galaragga finished as an MVP candidate. The 1998 Braves beat the Chicago Cubs three games to none in the National League Division Series. In the next round Atlanta then lost to the San Diego Padres in the National League Championship Series four games to two. Despite winning two games after losing the first three, Atlanta's comeback bid came short by being eliminated in game 6. San Diego's winning over Atlanta was seen as one of the biggest upsets in postseason history. ESPN columnist Jeff Merron also writes that the pitching staff of Maddux, Glavine, John Smoltz, Denny Neagle, and Kevin Millwood was the greatest of all time. The quintet posted a cumulative 2.97 ERA and amassed 88 wins (almost 18 wins per starter), equaling the win total of the 2nd place Mets. The 1998 Braves are the only team in MLB history to have five pitchers each strike out 150 batters in the same season. Glavine, the lone 20 game winner in the National League for that year, won the Cy Young Award. November 17, 1997: Walt Weiss was signed as a Free Agent with the Atlanta Braves. January 30, 1998: Dennis Martínez was signed as a Free Agent with the Atlanta Braves. February 6, 1998: Curtis Pride was signed as a Free Agent with the Atlanta Braves. 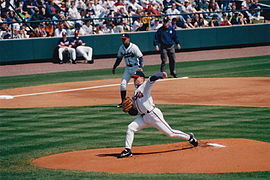 Tom Glavine pitches in spring training, 1998. Chipper Jones plays third base in background. June 9, 1998: Howard Battle was signed as a Free Agent with the Atlanta Braves. June 23, 1998: Alan Embree was traded by the Atlanta Braves to the Arizona Diamondbacks for Russ Springer. ^ "Pitching Season Finder, For single seasons, From 1901 to 2017, (requiring SO>=150)". Baseball Reference. Retrieved July 31, 2017.